See the garden at the back of the pond? A lot of this garden is "trial and error". I want to use as many natives as possible, but I'm not sure which will attract butterflies. I have many "trials" going on right now, I've learned that coral Porterweed is very popular with the butterflies. I've also learned that Gulf Fritillaries prefer the native Maypops (P. incarnata,) to a non-native red variety. 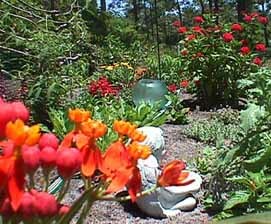 My garden resides in the Florida Panhandle, in Okaloosa County (zone 8b). 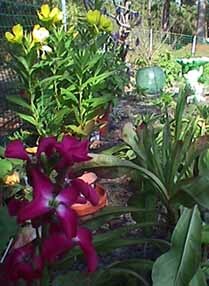 I have sandy soil and very humid weather to deal with. I've amended the sand with compost and manure. Water is another problem/blessing. The bottom of the berm on which the garden is planted is very boggy. The top of the berm is very dry. I've placed plants according to their water needs, rather than the typical color coordinating that most people do. Below are some new pics, taken in my garden. Just click on the thumbnail to see the larger picture. NEW in my garden this year! I've bought new host plants at my favorite native plant nursery. I'll add pages and info as I learn their growing habits, and see how the flutters respond to them. Spicebush, Sassafras, Buttonbush, Pawpaw, Flamevine, Pipevine, and Twinflower. 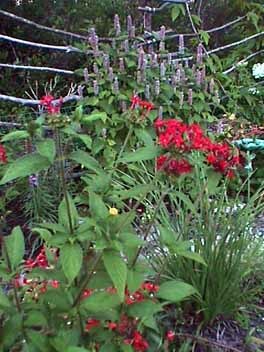 I've also found some great 'weeds' (native plants) in the garden that are great host plants or nectar plants: Lyre-leaf Sage, Cudweed, Blue Toadflax, Goldenrod, Florida Paintbrush, Liatris, and Deer Tongue. I'm currently working on new pages for each of my new plants. Please check back, or email me if you have any experiance in your garden with them! I grew these from seed and were very happy with them. They grew about knee high, and had great blue flowers. Although they struggled thru the hot, dry summer, they are still going, trying to bloom again in the cooler weather. I'll definatly plant them again. Host plant for Painted Ladies. Biannual, easily started from seed. Y2K update: They stayed green all winter, but never grew taller than 6 inches, and have never flowered. I assume it's due to the acidic soil. I've decided Hollyhocks just aren't for my garden, but I'll leave these in, and see what they do this year. Fall 2000 update: After 2 full years in the garden, they still haven't bloomed. The leaves are there, but not big. Something did eat them, although I never found out what it was. I'll leave them there, as they stay green with no care. I still hope that someday the Painted Ladies will discover them. I have purple and white annuals. Makes a good edging plant that is very easy to start from seed. Planted in a nectar garden with a butterfly bush and Pentas, these tiny flowers gave off a tremendous honey scent. I loved walking by this garden. Native to South America, but naturalized in South Fla. Likes rich, neutral, moist soil. Very pretty red and yellow flowers. Started flowering early in the season. Y2K update: Died back to the ground, but is coming back already. New growth was hit by a frost in Jan and killed back, but it's already coming back again. Doesn't transplant well. Stratify seeds. Start in small pots, and transplant when only a couple of inches tall. 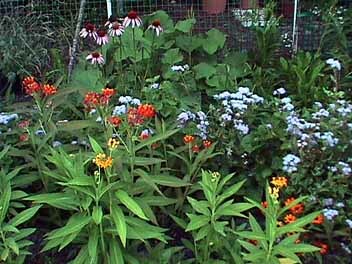 Host plant to Monarchs and many other butterflies. They also get nectar from Milkweeds. Another Must Have in a butterfly garden. Y2K update: Killed back over winter, but is already coming back. It's smaller than the other milkweeds, but is doing fine in March. A Florida native. Likes moist, open meadows and pond or swamp margins. If you have a moist place, you need this one. The monarchs seem to prefer this one over the other milkweeds. New plants (from seed) are getting ready to flower now. Y2K update: Died back to the ground, but is already coming back in March. I found 3 Monarch eggs on leaves March 8th, even though there isn't enough leaves to feed the little piggies yet. Really pretty magenta flowers. Looked great with the blue cornflowers and pink coral-nymph Salvia. Bloomed in spring, was gone by summer. Easy to start from seed. Cold hardy annual that reseeds itself. I started it, direct sowed, in January, it's been blooming since March. A host plant for the Painted Lady. Also attracts bumble bees. Doesn't do to well in the Fla. summers, though. It's already "done" in June, so I pulled it up to make room for something new. I might plant ONE plant this year - it is a favorite of bumble bees. Butterflies love it. Usually the cornerstone of a butterfly garden. My white one didn't make it. The purple one is still going strong, after 3 years. I got seeds for more varieties in 2000. I got these seeds from a seed swap. I planted the seedlings in the garden the first week of March. I'm not real sure how they like the sandy, acidic soil. They don't look like they are doing real good. I'll keep an eye on em, but I'm not going to baby them. Update: They flowered ok in spring, but didn't last thru the summer. Small tree. Host plant for sulphers. 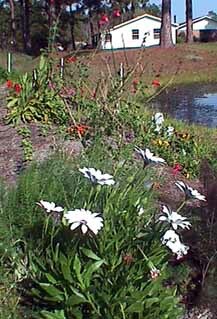 Easy to start from seed, flowers in early fall the first year. Y2K update: I kept three of these plants in containers, but didn't bring them inside over winter. They all died back over winter, and one is coming back in March. Looks like 2 didn't make it. They grow fast from seed, and I had pleanty of leaves for the Sulphur cats, so I won't worry if they don't make it thru the winter. Likes a little shade in the afternoon. Prefers moist, sandy soil. Reseeds easily (almost too easy) Didn't last long in my garden - maybe a little too acidic or too much sun. This one won't be repeated in 2000. Another seed swap jewel. These are doing great in the garden. They become a clump of blue flowers (hopefully), one foot wide, and two feet tall. Not sure how the butterflies like them, but the picture of the flowers are pretty. Update: Bloomed the first year from seed in spring/early summer. Didn't handle the hot Fla. temps well, but still were a nice plant. Soak seeds 24 hours prior to planting. Germinate in damp papertowels and zip lock baggies. Good tall nectar plant. Pretty, but basically ignored by the butterflies, although a stray frittillary will nectar once in a while.. I got some seed for white coneflowers this year. Hopefully they will do well too. Y2K update: Died back over winter, and I relocated most of them to a different part of the garden. They are all putting new growth out now, though. Host plant for Black Swallowtail. Easy to start from seed. I also have green fennel, which the cats seem to prefer. Y2K update: This plant handled the north Florida winter just fine, and never died back. Another seed swap find. I planted seedlings in the garden in March, and so far they are doing great. Update: I think these seeds were mis-labeled. They look just like blue Salvia I also planted. They are really pretty, intense blue, and I like them! They will stay in my blue and white (not butterfly) garden. Florida native. I started these from seed. They occur naturally in wet, swampy soil, reach 6 feet, has rose and cream colored flowers that show up in the spring and summer. Florida native. Occurs in swamps and wet areas. Bright red flower, shrub like to 6 feet. I started this from seed, and it flowered the first year. Y2K update: Died back to the ground, but is growing back really quick. In March, it's already 10 inches tall, and bushier than last year. A Florida native plant. I didn't plant these in my garden, Ma Nature did it for me. A good nectar plant, bumblebees love it..
A great butterfly attractor. Bright flowers take the baking sun and look great all summer long. Florida native. Flowers in fall, butterfly magnet. I notice butterflies love this one, and it grows in the wild intermingled with Goldenrod. 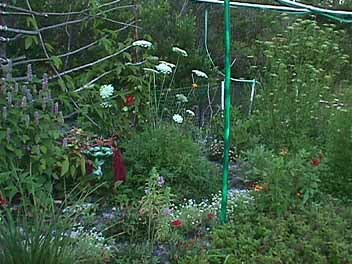 I collected lots of seed and scattered in the garden immediatly upon collecting. Also called Grecian Laurel, Sweet Bay, Bay Laurel, and Pepperwood. Host plant for the Palamedes Swallowtail. Beautiful, tropical flowers. Likes sunny places and moist, but well drained soil. I have a couple of species. One is a red Hawaiian species and the other was labeled "purple Passion vine." I also have the native "Maypops" or Passiflora incarta. Host plant for the Zebra Longwing and the Gulf Fritillary. Some produce an edible fruit, which flavors Hawaiian Punch. Frits prefer the maypops, and actually stripped mine. Caterpillars that were raised inside were fed leaves from the red Hawaiian species, and did just fine. Y2K update: Died back over winter, but is already coming back in Feb, 2000. I have runners all over my garden, ready for digging up and sharing with friends. An absolute MUST in any butterfly garden. My favorite nectar plant. A real butterfly magnet. Palmedes Swallowtails love it, and it also attracts hummingbirds. I will add MORE in 2000. Y2K update: Died back over the winter, I'm not sure if it will come back. I did root some cuttings last year, and will buy more plants this year. 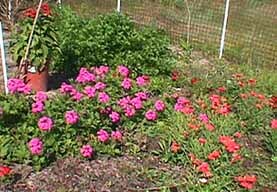 Fall update: I have lots of red Pentas, and white, pink and purple plants too. The white and pink plants were visited, but the purple was almost totally ignored. A Florida native plant. I started these from seed. They flowered the second year. These grew to a whopping 6 feet tall!! They'll need staking in windy places. Update: The butterflies ignored these, but hummers liked them. I think might move these into the white and blue 'human' garden. Not a good butterfly garden flower. Black Swallowtail host plant. You'll need lots! Easy to start from seed. Y2K update: Stayed green all winter, and looked really pretty. Actually filled back out after all the cats ate it last year. In early March, it's ready for the next generation of Black Swallowtails. A Florida native plant. Grows in sandy pinelands and wasts places. Likes dry, sandy, unfertle soil. Flowers open durnig the day, and close at night. Many people consider this one a weed. Looks great in the morning or on overcast days - flowers almost glow. Wild carrot. Biannual; Easily started from seed. A host plant for Black Swallowtail caterpillars. Most pretty white flower in the garden! Flower attracted a few insects and smaller butterflies, but Black Swallowtials obviously prefered Parsley and Fennel. I like this flower, though ,and it'll be back next year. Very easy to start from seed. A native all over the US. Looks nice with Purple Coneflower. Update: They were poppin up everywhere in my garden, soon as the blooms finish, I pull the whole plant up. The flowers were very pretty, but ignored by all insects. I might not give them the chance to flower next year. Reeseeds to an extent of being a pest. An evergreen herb. 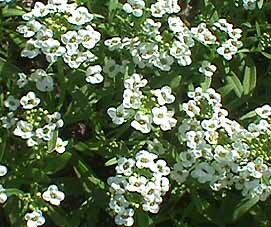 Grows in average soil, in sun or partial shade. 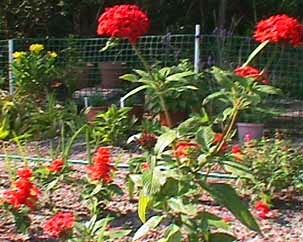 Host plant for Black Swallowtail and Giant Swallowtail caterpillars. Also and excellent repellant for Japanese Beetle and other beetles. Warning! Oils can burn sensitive skin; wear gloves when handling this plant. Y2K update: They droped a few leaves and turned yellow over winter. I don't think they like the acidic soil. I've read about their allopathic properties, and decided to dig them up and put them in containers. I can add lime and control the acidity this way too. Update: They did well in the container, and even flowered this year. I set the container out of the butterfly garden, in a more shaded place. The plant liked it, but I didn't find any cats on it this year. I started these from seed, and they were already flowering in May, and are still going strong in Oct. They are a good nectar plant. In 2000, I plan to plant more of these, in a large clump. Very pretty color. Y2K update: I didn't replant this year, but had them growing all over the garden! They looked as pretty as they did in '99. Sulphurs love them in early Nov, right along with the bumbles. Easy to start from seed. Soak 24 hours, and direct sow. A twining vine, needs something to climb. Almost done now, I'll pull them out (after collecting seeds) and plant something else. Attracted bumblebees, but not much of anything else. Didn't last long in my garden. It won't take up space there next year. On second thought, maybe I will plant them later in the year. I get long-tailed skippers in late summer/early fall. They host on beans. Maybe it can handle the cooler weather in Sept.
A Florida native. Great nectar plant. Comes in coral, white or blue. I have coral and blue. Coral is the prefered color to the butterflies. It is the second most visited flower in the garden.Y2K update: Died back over winter, not sure if it will come back. I did save some seed, but never got them to germinate. I've got to unlock the combination to get them to germinate. I'll not give up on thise butterfly magnet! Update: I worried for nothing - the blue Porterweed reseeded itself to the point of being a true weed. I did purchase another coral colored plant this year too. Bloomed early from seed. Was nice looking, tall, and butterflies liked them. They didn't last throughout the summer, and were long gone by July. I liked the orange Cosmos better. I have received lots of seed from swaps and generous people in my gardenwithbutterflies group (in egroups.com) and from the seed swap site in gardenweb.com - THANK YOU to all of you who sent me seeds and growing tips! As they grow, I'll add them to this list, and let ya know how they grow here.